So the Princess Charlotte Elizabeth Diana was born last week! 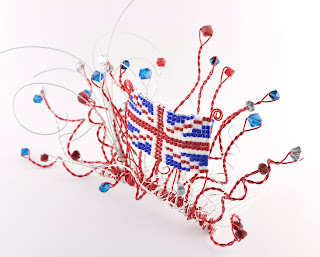 To commemorate this occasion, I made this amazingly patriotic head piece, that was just made for a garden party at Buckingham Palace! 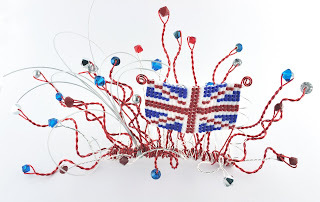 I have taken inspiration from the abundance of Union Jacks around and created a miniature beaded flag. It really is quite dinky and could be used in a number of creative ways, not just on a hair piece. 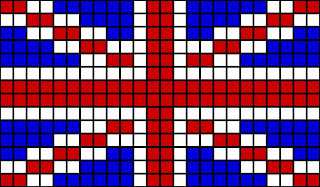 I have used a basic square stitch to weave this small Union Jack flag with size 11 Miyuki delicas to give it a neat finish. Square stitch is very strong and this project is perfect for those new to the stitch! I used 0.15mm Wildfire thread in Frost, but any beading thread you are happy using is fine, along with a size 10 beading needle. Follow the steps, carefully watching for colour changes on the chart. Step 1. 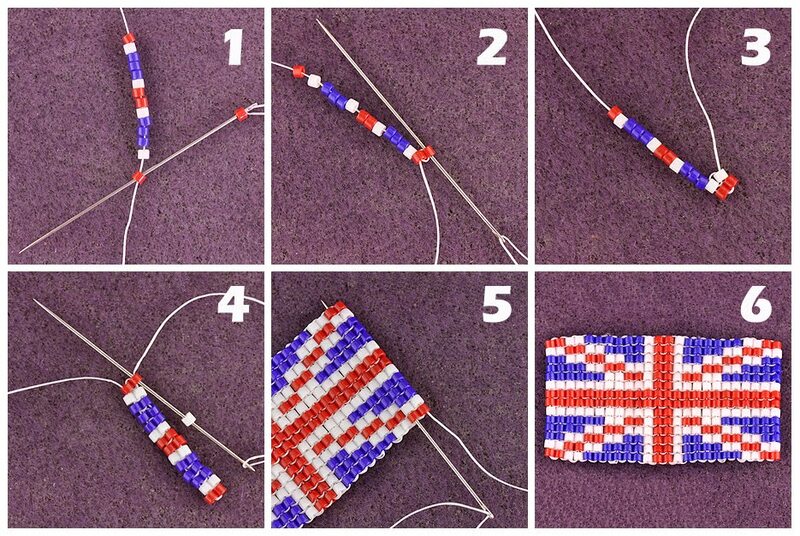 Cut a manageable length of thread, and add the first row of beads using a needle, following the chart above. Add the first bead of the next row and anchor through the last bead of the first row, in a loop. Step 2. Thread back through the first bead on the second row and pull your thread tight, and thread on the second bead of the second row. Step 3. 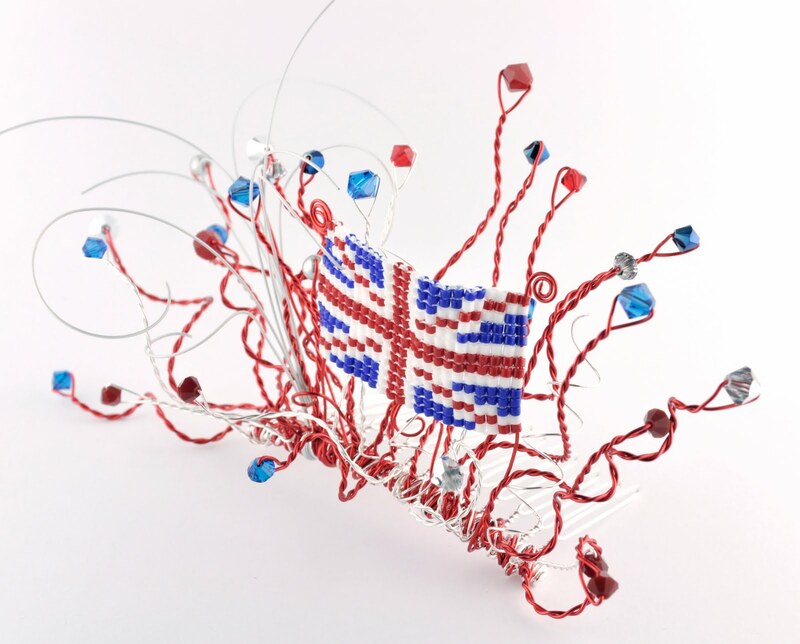 Secure this bead by looping through the second to last bead of the first row and back through the new bead again. Keep your tension tight all the time. Step 4. Carry on adding beads to the second row in the same way, anchoring the beads to the corresponding bead in the first row. Start the third row and continue in the same way. If you need to add any more thread, weave the end of your thread back and forth through a few rows & cut off the excess then add a new piece, securing in the same way, weaving through a few rows. Step 5. 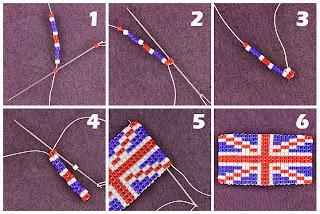 Once you have completed the Union Jack, weave the ends of the thread back through 2 or 3 rows before trimming off any excess. Step 6. Your Union Jack is complete and ready to use however you choose. You could turn your Union Flag into many items, including a small decorative flag with the addition of some wire, or why not create a loop with extra beads to hang on a keyring? Or go all out with extravagance and create your very own fascinator to wear!